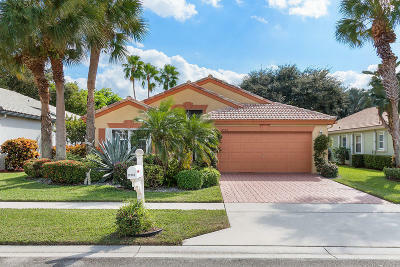 Space, style and luxury abound in this fabulous home in desired Majestic Isles community. Beautifully maintained free-standing home with open concept floor plan & high-vaulted ceilings. Two sets of sliders welcome an abundance of natural light & elegant breezes. Living room/dining area looks out onto gorgeous lanai with serene views, lush greenery and southern exposure - all making for perfect outdoor living or dining space. Filled with many upgrades and decorator touches including ceramic tile, wood laminate flooring, hand-painted mural(s) & walls detailing. Master suite with arched doorways, walk-in closets, large bath with Roman tub, separate shower & vanity areas. Split bedroom floor-plan ensures owner privacy. Enjoy Majestic Isles' fabulous clubhouse, swim and tennis and so much more. Listing Courtesy of EXP Realty, Inc.